Hungary’s collaboration with Nazi Germany during the Second World War was a “mistake” and a “sin” as it failed to protect its Jewish community, prime minister Viktor Orban has said. Mr Orban said he told visiting Israeli prime minister Benjamin Netanyahu that he was aware of the “difficult history behind us”. About 550,000 Hungarian Jews were killed in the Holocaust. “At an earlier time, the government of Hungary made a mistake, moreover, committed a sin, when it did not protect its citizens of Jewish heritage,” Mr Orban said during a press briefing after his meeting with Mr Netanyahu in the Hungarian parliament. “Every Hungarian government has the duty to protect all of its citizens, regardless of their heritage. “During World War Two, Hungary did not comply with this moral and political requirement. This is a sin because at the time we decided that, instead of protecting the Jewish community, we chose collaboration with the Nazis. Mr Netanyahu is the first Israeli premier to visit Hungary since 1989 when Hungary was still under communist rule. The Israeli leader said he thought about Hungary first in relation to the birth of modern Zionism, as Theodore Herzl, “our modern Moses”, was born in Budapest in 1860. 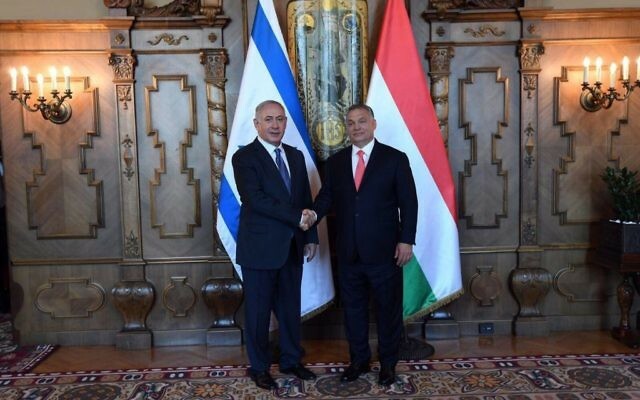 Mr Netanyahu thanked his host for Hungary’s repeated support for Israel, citing French President Emmanuel Macron’s recent statement drawing a parallel between anti-Semitism and criticism of Israel. “Macron said there is a new anti-Semitism that is expressed in anti-Zionism, that is delegitimising the one and only Jewish state,” Mr Netanyahu said. Mr Orban again expressed his government’s “zero tolerance” for anti-Semitism, although a recent government campaign against George Soros and the Hungarian-American billionaire philanthropist’s support for migration and refugees has been criticised by Jewish organisations for its anti-Semitic overtones, which Mr Orban’s government denies. The Hungarian leader also repeated his opposition to mass migration mostly by Muslims, which he has said would lead to irreversible changes in European culture and its population. “I made it clear that Hungary has serious disputes in the European Union, as Hungary does not want a mixed population,” Mr Orban said. Hungary “does not want to change its current ethnic composition, it does not want to defer to any external, artificial influence”. “We’d like to remain as we are, even if, I have to admit, we are not perfect,” he added. On Wednesday, Mr Netanyahu and Mr Orban will meet the leaders of Poland, the Czech Republic and Slovakia – Hungary’s partners in the so-called Visegrad Group.